Injecting Kellen Mond into lineups might seem unwise at this point in the season. However, if a CFF owner needs a replacement, the Aggies field general must be on the short list of possible candidates. Over the past five weeks, the Aggies schedule has been difficult, and the offense could not get on track. Texas A&M travelled for the past three weeks, and Mond produced less than 20 points in all three outings: Kentucky, Mississippi State and Auburn. When the campaign kicked off in August, Mond began the season with two games scoring over 20 points and twice eclipsed 30 points. On Saturday, the Aggies welcome Mississippi and are huge favorites at home. Mond surely passes for over 250 yards and three touchdowns against the Rebels. After recording the DFSDudes Podcast last Thursday, I grabbed a Big Cranky (IPA) by Stony Creek Brewery and turned on the Temple-UCF game. Without much fanfare, Coach Geoff Collins has quietly composed an explosive offense: Temple averages 406 yards and 31.6 points per game. Quarterback Anthony Russo took the reins of the unit over five games ago and has been very productive. The redshirt sophomore has passed for 1,490 yards (298 ypg.) and 12 touchdowns during the hot streak. At 6-foot-4 and 230 pounds, Russo is a pocket gunslinger who makes difficult throws with good zip and touch. "Each week, gaining that confidence is a big thing, especially at this position, and just getting comfortable with the calls, what Coach [offensive coordinator Dave Patenaude] is calling that week," Russo said. On the road in Houston, the Owls are likely in another shootout, and Russo surely attempts over 40 passes on Saturday, which is fantasy gold. The matchup and game script foreshadows a big afternoon for the North Texas ground game. The Monarchs are ranked 118th in the FBS versus the run, allowing 232 rushing yards per game and permitting 24 touchdowns. During the last month, DeAndre Torrey is the sixteenth most productive runner in ppr-formats despite only playing three games. He has rushed for 260 yards, corralled seven passes and totaled seven touchdowns. In 2018, the sophomore has scored three touchdowns in three separate games. On Homecoming weekend two weeks ago, North Texas dominated Rice, and Torrey provided the offensive fireworks. “I knew the team needed me,” said Torrey afterwards. “When the fourth quarter came I knew it was my time, I wanted the ball and weight on my shoulders.” While he might not reach the promised land another three times versus Old Dominion, Torrey should score twice and easily total over 100 yards from scrimmage. While there is very little chance that UConn wins at home on Saturday, I cannot wait to see the game. I am a diehard Huskies fan no matter the outcome of the game or season-long record. 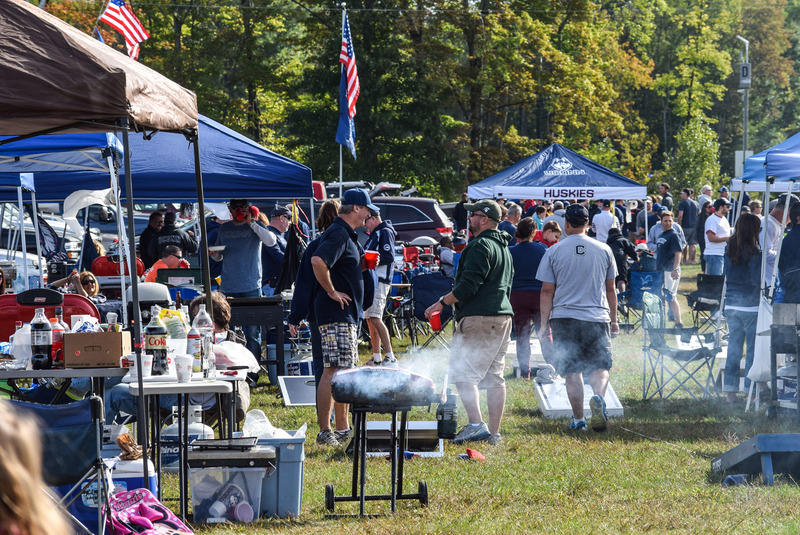 College football tailgating is one of my favorite past times and I will enjoy the festivities with my son, nephew and brother. Last year, Ke’Mon Freeman led the Mustangs in rushing touchdowns with 11 and rushed for 543 yards. Until last week’s upset over Houston, he had not scored a single time this season because of injury-related absences. Against the Cougars, Freeman earned a season-best 20 carries, gained 107 yards on the ground and scored twice. UConn’s run defense has been a sieve all season: The Huskies have been bludgeoned for over 300 yards per game and 32 touchdowns. SMU is a huge road favorite and will surely pound UConn on the ground in the second half. The Mustangs easily accumulate over 250 rushing yards, and Freeman likely garners another 20 carries. Go grab Freeman as a flex starter this weekend. Every Wednesday, I take my 8-year old daughter to violin lessons and begin my research for the upcoming weekend. 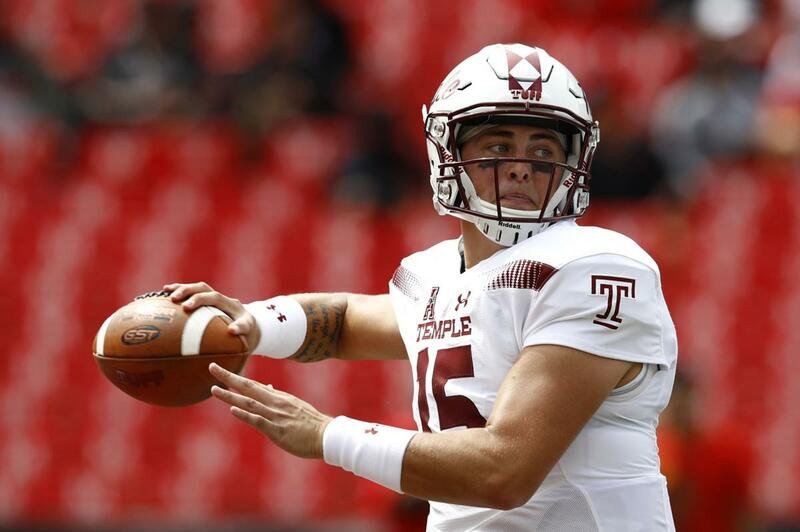 While looking at the over-under totals, the Temple-Houston game warranted scrutinization. I desperately want a few pieces of the Owls’ passing game, and Ventell Bryant is available in nearly every CFF league. Since Anthony Russo began calling signals, the senior playmaker has become more involved in the aerial assault. Over the past three weeks, he has snatched 17 passes for 308 yards and reached pay dirt three times. All signs point toward another offensive outburst for Temple, and Bryant likely reaches the end zone for the fourth time in four games. Usually, a team with only two victories would not provide much assistance for CFF diehards. However, the Beavers have a couple of noteworthy starters: RB Jermar Jefferson and WR Isaiah Hodgins. While Jefferson is not available on most waiver wires, Hodgins can still be plucked and inserted into lineups. The 6-foot-4 and 208-pound sophomore has had an up-and-down season. He had 14 catches for 200 yards and two scores against Nevada on September 15. Afterwards, he fell off the radar and missed the game versus Washington State. Over the past two weeks, the sophomore has bounced back with 19 receptions for 275 yards and two touchdowns. Oregon State is a huge underdog and will be playing catchup the entire second half. Hodgins will be heavily targeted and effortlessly eclipses 100-yards receiving for the third consecutive week.